On Saturday: January 19, 2017, the Clinton County Middle School hosted the 46th District KAAC Governor’s Cup competition. 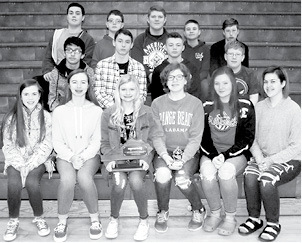 The Clinton County Middle School Academic Team placed 1st overall, winning the District tournament. The team placed 1st in Quick Recall and 1st in Future Problem Solving. Several students won individual awards for Written Assessment as well. Evan Little placed 1st and Emma Tompkins placed 3rd in Arts and Humanities. Loren Little placed 1st, Alex Duvall placed 3rd, and EllaRose Smith placed 5th in Language Arts. Malachi Upchurch placed 4th in Mathematics. Caleb Marcum placed 2nd, and Tyler Guffey placed 3rd in Science. Ryan Bair placed 1st and Emma Tompkins placed 2nd in Social Studies. Ashton Daniels placed 2nd and Valarie Latham placed 4th in Composition. The team also received the Hume Sportsmanship Award, voted on by all of the participating schools. The entire team will advance to the 12th Region KAAC Governor’s Cup competition on February 2nd.